“The Flood’s The Fault Of The Rain”, the new video from L.A. GUNS, can be seen below. The track is taken from the band’s latest album, “The Missing Peace”, which was released on October 13 via the Italian record label Frontiers Music Srl. The disc’s cover artwork was created by the Las Vegas portrait painter Kahla and can be seen below. 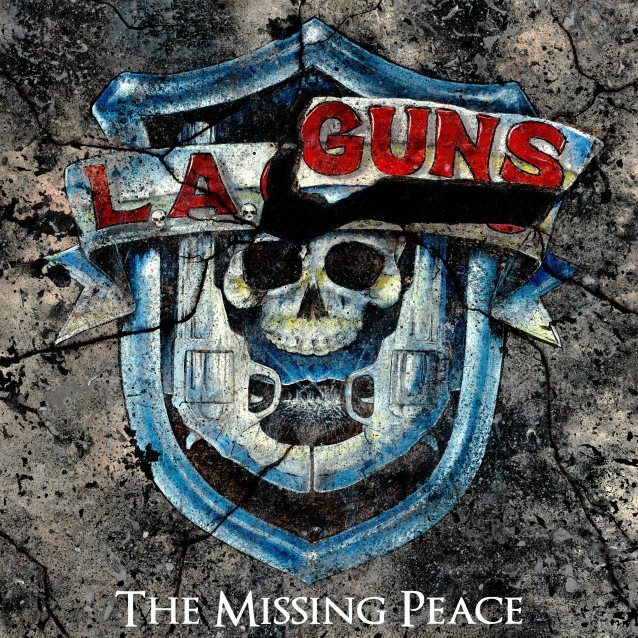 As the revival of the classic ’80s hard rock and heavy metal scene continues unabated here in the 21st century, one reunion has been at the top of the wishlists of many a fan for a long time: the songwriting combination of Tracii Guns and Philip Lewis under the L.A. GUNS banner. What once seemed like a distant memory with no hope of returning has now come around and fans are about to be rewarded for keeping their fingers crossed and their hopes up. The last time Lewis and Guns joined forces was back in 2000 with legendary producer Andy Johns for the making of what would become “Waking The Dead”. L.A. GUNS‘ present lineup is rounded out by Shane Fitzgibbon on drums and Johnny Martin on bass with Michael Grant on guitar as a touring member. Back in December, Phil announced that he was leaving the L.A. GUNS version that included drummer Steve Riley.